Summer Arts Workshop offers all students a positive and creative space to grow and explore. This year, we've expanded options for students based on age and area of interest. We’re offering 4-week Performance One & Teen Performance classes that incorporate place-based learning, will host a Saturday "Student Work Festival" for Performance students, and offer an extended day program to keep the adventure going until 5PM! We also have a Summer Arts Workshop Scholarship Program, an ArtsEd program for anyone interested in youth arts education and several volunteer opportunities. If you have any questions about scholarships email us at scholarships@theaterintheopen.org. For any other program questions, please call 978-465-2572, or email us at info@theaterintheopen.org. For your five-year-old artists we offer a thoughtful introduction to our Theater Arts Workshop. Workshop 5 has limited enrollment, a shorter day and a focus on art and collaborative group games. Our youngest students will have the campus to themselves for a week of engagement with nature, art and each other. Hands-on and enriching, this outdoor summer program includes daily classes in acting, improvisation, dance and visual art. It’s two weeks of pure fun, where students are free to explore their imaginations, build communication skills and explore nature. Our professional staff of artists and educators creates a supportive and non-competitive environment that fosters both personal and artistic growth. On the final day of each session, at 1pm, family and friends are invited to Share Day to see what students have been learning. We offer four sessions of Workshop. Please note, *Session 3 is our special "Circus Session," registration cost includes a day on the Spencer-Peirce-Little Farm and a discounted ticket to Circus Smirkus! Session 3: July 29 - Aug 9*; Session 4: Aug 12 - 23. 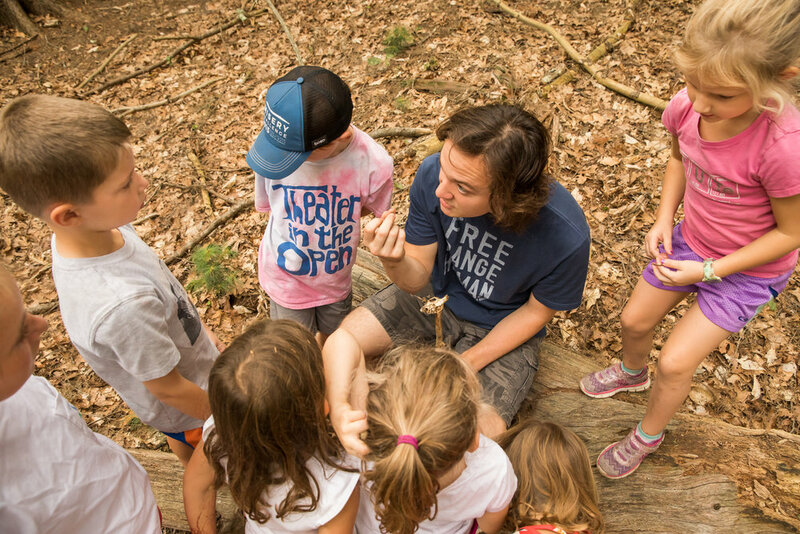 This year, our performance classes will be teaming up with ecologists and native plant advocates to develop our own myths centered on the native flora and fauna of Maudslay State Park. During our explorations in the Park, we’ll make connections between the natural world and traditional mythology to create and perform stories that are completely new. These 4-week programs are for students interested in more of a performance challenge. Also new this year is that all our Teen Performance students will have the opportunity to work with professional directors and stage managers, learning to develop scripts, staging, puppetry and costumes in order to present completely new and original work. We are excited to offer this new Performance Class curriculum and to develop productions that will be introduced at our Student Work Festival on Saturday, July 27. Exploring Shakespeare is a unique opportunity to study the foundations that must be laid when adapting Shakespeare's work to the stage. Across these two weeks, students will approach and interpret text as performance artists, visual artists and collaborative artists. This year’s "Exploring Movement" curriculum has been developed in partnership with The Dance Place. This exciting program is part physical theater, part dance and part storytelling class. Students will learn to collaborate through expressive movement while exploring classical stories. For those who would like to enjoy our campus and Maudslay State Park for a longer day, we are introducing an Extended Day Program. This class will run in weekly blocks, every afternoon, and will be led by our experienced teaching staff. They will lead students throughout Maudslay for less structured — but no less fun — adventures. Students will get extra time in the tent and also play active, cooperative games and do portable art projects. Workshop students who stay for this class should pack a second snack. Please note: This program does not replace our drop-in aftercare program, which will continue to be available. Dates: Available Weekly, July 1 - Aug 23. This program is designed for students who have discovered a passion for arts education. ArtsEd students will begin learning, in a hands-on way, how art, dance and theater can be employed to facilitate creative expression and individual growth. This program includes time spent each day discussing pedagogy with head teachers and program directors. To ensure a rewarding learning experience, ArtsEd has a limited enrollment and applicants will be selected by the Workshop Director. For more information about the application process, click here. Tuition scholarships are available for families who qualify. In order to help as many families as possible, TITO commonly awards partial scholarships. You can download a copy of the Scholarship Application here. For more information, or to request an application, please email us at scholarships@theaterintheopen.org. Early/Aftercare is available mornings from 8am-9am and afternoons from 2pm-5pm for an additional fee of $12/hour. Participation can be arranged as needed on a day-to-day basis. Please note, we also have a new Adventures in the Open class that weekly meets from 2 - 5pm. This program is for those students who would like a longer day with their TITO friends. non-profit 501 (c) (3) organization, performs for free at Maudslay State Park, and has built a reputation for its original storytelling, professional, family-friendly productions and engaging youth arts education programs.